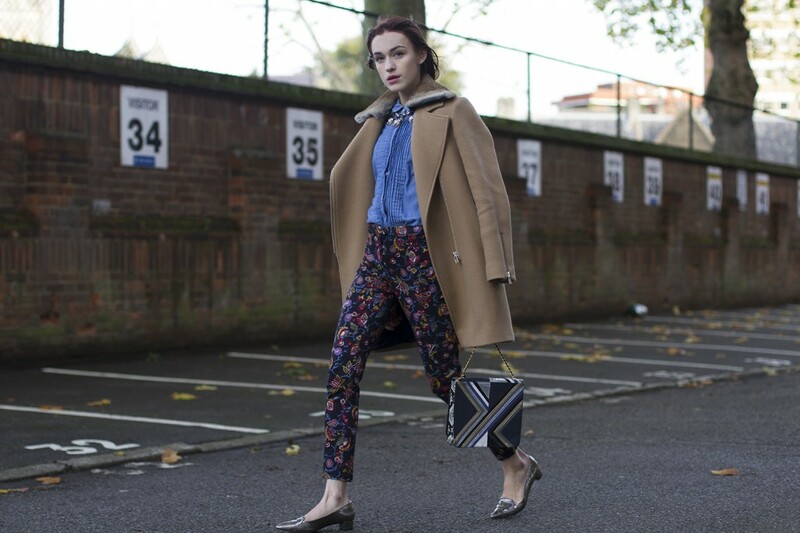 Ella of famed blog ‘La Petite Anglaise’ is always one to do us proud with her unique take on styling our array of satchels; here she is seen showing off our ever popular Graphic Satchel in blue leather. Paisley is a print that remains stylish whatever decade; from the folksy styles of the 1970s to the flash of a handkerchief in a mans suit, paisley is a print that adds a touch of British eccentricity to any outfit. As Ella points out, this charming motif has its origins in Persia and has been a stalwart of Western style since the 18th century has earned its status as a sartorial classic I think you’ll agree! We love how Ella has juxtaposed the intricate paisley pattern of her trousers with the bold chevrons of our satchel, proving that matching isn’t always the way to go. She has also picked out the flashes of metallic in the satchel by pairing with some on trend silver party flats.